Manuel Valls received a thunderous ovation for his spirited defense of law and order policies at the Socialist Party summer school. The French left takes its ideology seriously and therefore the Parti Socialiste luminaries gathered for the annual summer school at La Rochelle. The star of the session was the embattled Interior Minister Manuel Valls, who had been booed and jostled at Amiens, a recent scene of rioting. The Interior Minister had also continued the policy of the previous government in dismantling Roma (gypsy) encampments. The leftist daily Liberation raised the question how was this leftist government different from the center-right government that preceded it? 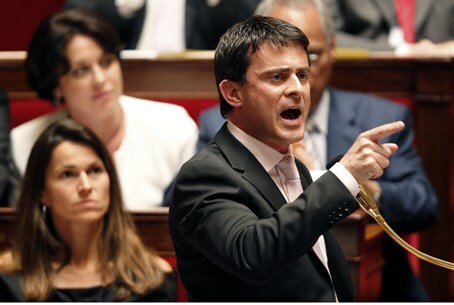 Valls, who was born in Spain but has lived in France for 30 years, basically turned the table on his critics. One can safely say that the French Socialist party had belatedly discovered Bill Clinton and Tony Blair on the issue, namely that the center left has to make the issue of fighting crime its own. The biggest headache of the left is its hemorrhaging of blue-collar support to the National Front of Marine Le Pen. If the left wanted the low income groups to believe in the Republic, argued Valls ,it had to provide them with security, because lower income groups were the prime victims of crime. The Interior Minister also wondered why the left that had invented the term French nation was willing to "leave to others, to the right and to the extreme right the colors, the national hymn and the history." Valls demanded of his party to back the police and the gendarmes "especially when one is firing on them for those who fire on them are not doing this in the name of a revolt or a revolution but to prevent the forces of order from intervening in the neighborhoods to dismantle the traffic of weapons and the traffic in drugs." Valls received thunderous applause after his speech. "France's national anthem is: The Marseillaise, The Versaillaise, the Paimpolaise?" "
The Elysée Palace houses: The justice ministry, a hotel group, the French President?" "Brigitte Bardot was: A film actress, a fashion designer, a female boxer?" Molière wrote "Plays, gardening books or crime novels".